In reaction to the serialist hegemony that pervaded much of the musical art world in the decades immediately after World War II, new musical movements inevitably arose. Aleatory had already pro­vided a stark alternative to the ultrarationalism of the period, but by the 1960s minimalism, neo-romanticism, third-stream, and other musics were also joining the opposition. At the same time, many com­posers remained committed to a modernist post-tonal language but abandoned some or all serialist strictures. Absent the structural and unifying power of serialism, “free atonality” as developed primari­ly by Schoenberg and his circle in the years 1908-1923 took on new relevance. Its procedures continue to inform present-day work in the idiom. 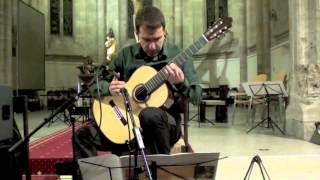 “Perspectives impaires” for solo guitar by Bulgarian Atanas Ourk­ouzounov (b.1970) stands squarely in this neo-atonal tradition. The work displays a number of features that underscore its debt to World War I era atonality. One is brevity, which can be seen in its seven short movements: I. Capriccioso; II. Allegro ritmico; III. Poco rubato; IV. Allegro; V. Largo, poco rubato; VI. Vivo, nervosa; VII. Recitativo, rubato. Other parallels are evident throughout the work, but the following discussion focuses on the first movement only. Capriccioso opens with all twelve pitch classes presented within the span of its first phrase (mm. 1-3). This technique of chromatic saturation, though observable in some late tonal music too, character­ized much early atonal literature. After the full chromatic gamut has unfolded, the process repeats for several more cycles. This is the case both in the Schoenbergian repertory and the present piece. Within each cycle some pitch classes recur, and between cycles their order changes, thus differing from row technique. Pitch content is organized by the presentation of motives and longer themes, restated or developed, and manifested in both horizontal and vertical arrays. For instance, the opening trichord, F-E-E-flat-two major sevenths superimposed-is compacted in the next measure to two semitones and transposed to create the stepwise figure, C-sharp-C-B. Further manipulation pro­duces a second symmetrical motive, C-B-A-flat-G, which in various transposed and permuted forms serves as a central referential element. By such methods, Ourkouzounov realizes one of the reigning ideals of most atonal composition: integration of the melodic and harmonie planes. At the end of Capriccioso the composer brings back his opening theme, verticalizing its former linear elements and following it with his second main theme (from mm.8-9), the latter restated three times exactly and a final rime varied. Using verbatim repetition to round off a piece was rare in prior atonal practice, but the overarching ternary scheme of A-B-A’, wherein the outer sections function as exposition and recapitulation while the middle is developmental, was common. On a larger scale Perspectives impaires is cyclic, with main motives of the first movement recurring in the other six. Rhythmically, Ourkouzounov’s composition departs markedly from Schoenberg’s early Viennese school and points to other influences. Irregular meter, moving among all values from 4/8 to 13/8, governs the rhythm of the faster movements, stabilized by the unwavering eighth­-note denominator of the time signatures. One of the most engaging features of these up-tempo movements lies in the way that mensurally unpredictable beat groupings counteract the steady underlying unit of measure. Rubato movements are written without time signatures or bar lines and alternate with their livelier counterparts to convey a spectrum of moods. All but one of the movements of Perspectives impaires are poly­phonically conceived. Of these, Capriccioso is the most intricate. Appropriately, Ourkouzounov employs harmonies more abundantly here than elsewhere. Such light, crystalline tones counterbalance the inherent density of a multipart, chromatically saturated texture like this one. Sinusoïdal color was similarly employed by the Viennese atonalists. Interestingly, Schoenberg’s last free atonal work, Serenade, Op. 24 (1923), included guitar and mandolin, which supplied timbres analogous to harp and celesta in previous works. (Webern also used guitar in his Drei Lieder, Op. 18 of 1925, after turning to serialism.) So Serenade links the guitar directly to early atonality and its sound ideals. In our present age of diverse and fragmented culture, that century-old aesthetic remains a strong current of creative expression. Works like Perspective impaires assure the guitar’s continued place in the discourse.